To improve your lawn, maybe repair some damage area or adjust your mowing height it’s a good idea to renovate your entire lawn area. 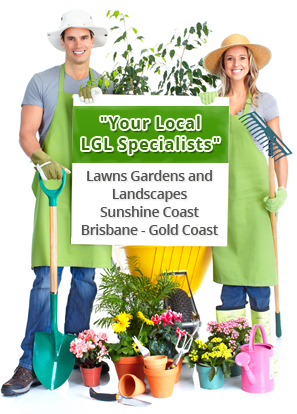 It is like pruning your lawn and is often done in spring, we have a DIY sheet (click here) for you to follow or call our office and we will arrange somebody to come out. 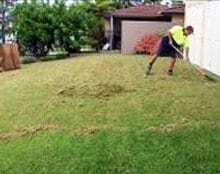 Use a lawn scarifier to remove any thatch, pass over the lawn twice or more in different directions. 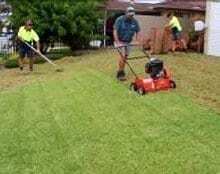 A mower can be used to do the same thing, just lower it a couple of notches, it will take longer to repair itself. 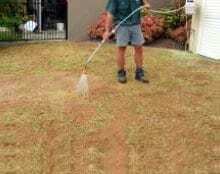 Remove clippings using a plastic rake. They will make great garden mulch or composted in the vegie patch. 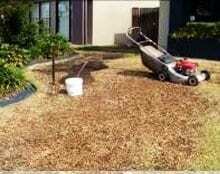 Now mow your lawn, start on a high setting, then lower it to the desired setting, somewhere between notch 3 – 4 – 5. Mow your lawn twice at this setting in a different direction each time. 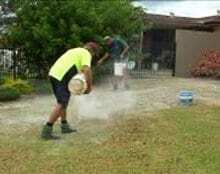 Use a good clean soil for best results as long as it comes from a reputable garden centre. 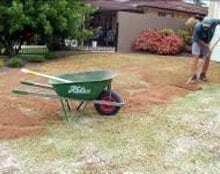 Rate 1 m3 of soil to 100 m2 of lawn area. Now using a hand held hose wash the top dressing into the lawn. Give your lawn another watering in the next couple of days.